Orca Whale surfing - Northern Resident Orca Whale. The sight of this large male orca whale surfing behind the boat in Johnstone Strait, caught these whale watchers by surprise. It is an inspiring and grand sight to see a large killer whale keeping pace with a fast boat as if it were a game. The sheer power of an orca whale surfing is demonstrated here as the whale watching vessel powers along at 20 knots, this large male killer whale is easily keeping pace. 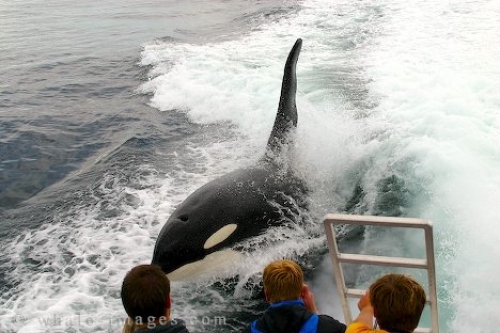 Picture of tourists and a surfing Killer Whale beside a whale watching boat in Queen Charlotte Sound, Vancouver Island, Canada.